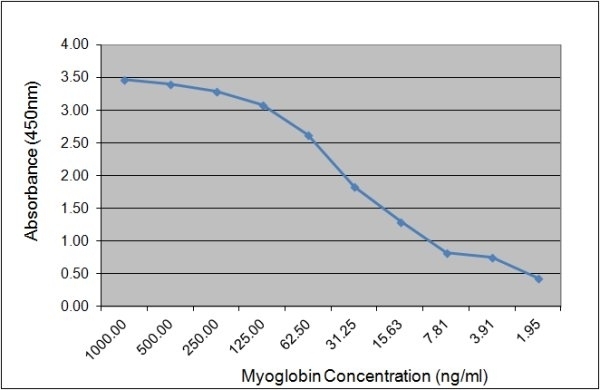 Detection of human myoglobin (PHP156) in sandwich ELISA using Mouse anti Human myoglobin (MCA5876G) as the capture reagent and HRP-conjugated Mouse anti Human myoglobin (MCA5874G) as the detection reagent. HRP-conjugation of the antibody used in this assay was performed using a LYNX Rapid HRP Antibody Conjugation Kit®. Mouse anti Human myoglobin, clone 164.3D5 is a monoclonal antibody recognizing human myoglobin, a single-chain globular ~17 kDa protein containing a heme prosthetic group localized to skeletal muscle. Myoglobin is responsible for the storage and movement of oxygen in muscle tissue. Myoglobin is released from injured muscle into the bloodstream, making it a sensitive marker for all muscle injury. It is commonly used in combination with troponin as a marker for myocardial damage in heart attacks. It is filtered by the kidneys, but is a potential cause of renal failure as it is toxic to the renal tubular epithelium (Lima et al. 2008).